The Bare Access Flex was an excellent choice for running on mixed trails because of its relaxed fit and sleek construction, according to a reviewer. Many runners praised the outsole’s performance in wet environments. Several users noted that the shoe was lightweight and was very comfortable to use on short-distance runs. The midsole was quite responsive and delivered a lot of feedback, stated a tester. There were some who thought that the toe box was nicely shaped; not too wide but also not restrictive. The shoe fared well on the technical trails even without a sock, a user wrote. A reviewer mentioned that this running shoe did not perform well on tempo runs. The fabric of the upper has worn out after a brief time, a lot of users observed. Few runners commented that the Bare Access Flex offered less support compared to its predecessor. Some consumers observed squeaking sounds while walking and running in the shoe. A couple of buyers said the arch support was a little too aggressive for a neutral shoe. The Merrell Bare Access Flex is an attractive shoe that has excelled in the criteria of comfort and support. Some runners thought poorly of its durability, while others praised the shoe’s versatility amidst different running conditions. Given its performance on the road, the Bare Access Flex is a good option for runners who are looking for an affordable and reliable neutral shoe. Merrell Bare Access Flex - an excellent shoe to spice up your regular runs! Over the past 20 odd years, I have gradually transformed from a traditional road runner sporting large drop shoes and plenty cushioning, to lower drop shoes and no cushioning. This transformation originates from an increased preference for trails, and through this the opportunity to try out shoes with less cushioning without fear of injuries. 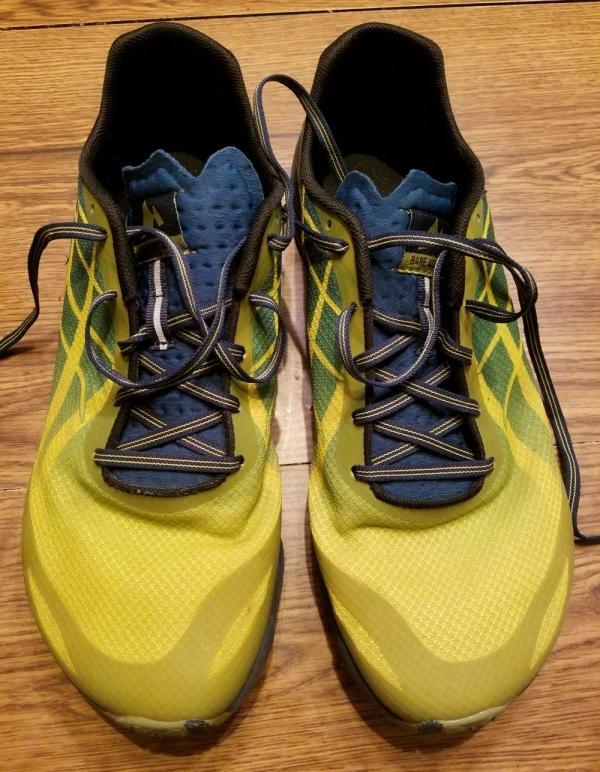 Along the way, I got a pair of Merrell Bare Access Flex on sale and loved their no-frills "barefoot feel" - real barefoot runners are probably going to "troll" me for using the barefoot word to describe a pair of semi-regular running shoes. Regardless - the Bare Access Flex does give a kind of barefoot feel, and took me by surprise: They were extremely comfortable from run one. The Bare Access Flex comes in a series of colors, I went for the so-called Black, which sports a range of dark-greyish colors with a bit of orange contrast. The design and colors are not going to cause any unwanted attention. They are simply nice, low-key looking shoes. The Bare Access Flex is without a doubt the most comfortable running shoes I've ever worn. They are so light and flexible that they instantly transform to your feet - almost like a sock. There is ample room for your toes - and even though I do not have particularly wide feet I thoroughly enjoy a bit of wiggle room - especially on longer runs. This, however, is also one of the drawbacks - the Bare Access FLex is not suitable for very technical stuff when you need full control (blisters here I come). On the other hand, they ride so low (without cushioning or rockplate) that you feel every pebble and pine cone you encounter. This gives you another type of control, which is nice in its own way. The Bare Access Flex is classified as a trail shoe by Merrell. Yet, the outsole is flat and the grooves/lugs almost non-existent. This is okay and gives you a decent grip on regular trails, tracks, and paths. However, if you encounter sandy or muddy sections they will slip'n'slide like there is no tomorrow. In my mind, the Bare Access Flex is more a cross-over type shoe, which will give you an excellent ride when you run on mixed terrain. I regularly use mine for a mixture of flat road-to-trail type runs - and for this they are superb. The Bare Access Flex has a very well ventilated and comfortable upper, which allows moisture and heat to escape very easily. Around where I live, they are perfect in the summertime. However, allowing moisture to escape easily often also involve the opposite - moisture getting in. Because they ride rather low and the upper is made of a very open weave fabric, I sometimes feel the Bare Access Flex actively absorb moisture. In most of my other shoes, I'm able to run in shallow puddles without getting wet - not the Bare Access Flex. Even the shallowest of puddles will instantly seep through the Bare Access Flex, and so will fine-grain sand and clay. There is hardly any toe protection - so again, not the perfect shoe for technical stuff. After almost 200 kilometers, I can hardly see any wear on the outsole nor the upper. Mind you I always run on soft terrain and always run slowly and carefully. I haven't had any issues, yet the upper seems so light and thin that if you took these shoes off-trail or on rocky river-beds, I doubt the upper would last long - and neither would your toes for that matter. I got mine on sale - yet even at their regular price, they are not overly expensive. Since I haven't seen them to their "end-of-life" I cannot conclude on their longevity - but I still think I got plenty value for money. The Bare Access Flex is excellent when you run on a mixture of road and light trails and are used to low or zero drop shoes. They are extremely lightweight and on average I run 10-20 seconds faster per kilometer (without consciously trying to). I don't think the Bare Access Flex officially classify as "racing flats", yet in many respects, they have that same feel to them. If you normally use high-drop/cushioned shoes - better watch out! The Bare Access Flex has zero drop and very little cushioning, and this is not for everyone to enjoy. I love the Merrell Bare Access Flex. They are wonderful for the easy run on flat mixed terrain/road-to-trail stuff - for more rugged stuff, nah. They offer a nice change to my other more rugged trail shoes on training runs - yet they are too flimsy to become "regulars" in real off-road situations. I like to wear them occasionally to "exercise" and "challenge" the nerves and muscles in my legs and feet by going no-drop, low-stack. I have even worn these doing half marathons and longer in the summer time. They are - however - too cold for any serious winter running where I live. Once they retire from active duty I think I will give them a thorough wash and start using them as my go-to sneaker for comfortable casual and semi-formal situations. Since beginning my transition towards a more minimal shoe, I have been eager to test the flexibility and responsiveness of Merrell's Bare Access line. This year, the shoe received a major re-design that changed some key features from previous years. If you enjoy a shoe that feels barely there, while providing essential dampening from the concrete, this shoe is worth a look. In contrast to the Merrell Bare Access Flex has significantly changed the location and amount of TPU overlays, shifting away from the midfoot cage overlay pattern in favor of a "toe guard" application and a flexible yet noticeable overlay on the heel where one might normally find a heel counter. 100+ miles in, I have noticed that this has helped the heel retain its shape. On the other hand, the shift away from the TPU at the midfoot has made for a looser and more relaxed fit. In addition, while the Bare Access line has prided itself on providing a generous toe box, this iteration has definitely increased the width and depth, giving it a more roomy feel. In fact, I even took a half size down from my normal shoe size (10.5 down from 11) and felt like I had more room available than any shoe I have recently tried. While meant to be a transitional shoe from a true trainer to a barefoot model, the Flex has a surprising amount of moldable cushioning that can be perceived right out of the box. The footbed is sewn-in and feels like it is contoured to accept the arch and mold to it rather than provide rigid support. It would certainly not be considered a plush ride, but gives positive feedback from the road while taking the edge off on long runs of 14+ miles (which is it's intended purpose). After 100+ miles on this shoe on varied terrain (track, treadmill, trail, and road) the shoe has retained the best of its characteristics quite well. The outsole now uses a proprietary rubber compound from Merrell (as opposed to the familiar Vibram outsole of models past). The new compound has great grip and traction even after logging some serious miles and on varied, slick and/or dusty surfaces. The upper, while lacking in the previous amount of TPU overlays, is holding up well, with a looser fit as time has gone on, but not sloppy or concerning as a risk for blistering or hot spots. Thus far, I've noticed that there are slightly fewer color options with the Flex, but it retains similar aesthetics from previous models. The colors are by and large brighter and flashier, but there is one toned down version for those looking for more versatility in their shoe. May feel overly loose to those not familiar with the shoe. While Merrell Bare Access Flex is not one I would recommend to most of my patients, this is a great transitional shoe for those who are thinking about changing their running style and dipping a toe (pun intended) into the barefoot and near-barefoot training. It has held up well for the miles I've put on it (and with the anti-microbial coating in the shoe) is still relatively odor-free, even when wearing without socks. Definitely, it is a loose fitting and long shoe, so sizing one-half size down is recommended for a more comfortable ride and fit. Overall, I really enjoyed the shoe. I will continue to use this for all types of workouts. My feet need to get used to wearing this shoes for sure but overall, I really really like them. The Merrell Bare Access Flex is an all-terrain shoe that claims to offer a natural running sensation. It’s designed for people who have medium-high to high arches. It has a zero heel-to-toe drop and generous cushioning for a relaxed feel on both the trail and the road. The mesh upper provides a durable and breathable coverage. It is being assisted by TPU overlays to enable a secure fit. The internal neoprene lining has anti-microbial properties for a healthy environment for the foot. The FLEXconnect™ midsole brings a flexible running experience and protection over a variety of distances. 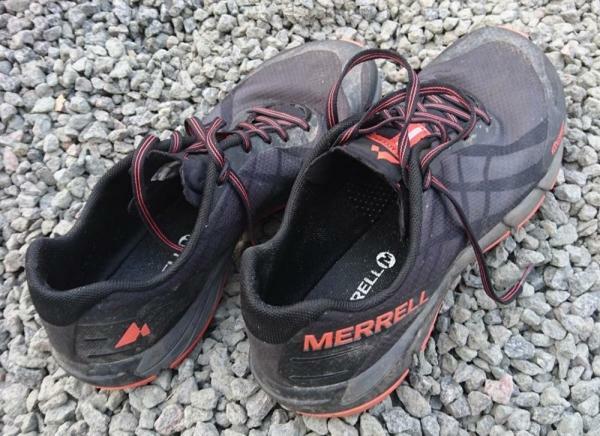 The Merrell Bare Access Flex has a low stack height and a medium-wide construction. Runners are recommended to get a half-size smaller than the standard running shoe length to obtain a suitable in-shoe experience. The width profiles are D – Medium for the men’s version and B – Medium for the women’s version. The M Select™ Grip+ rubber outsole has anatomical grooves for a sticky and durable grip in all directions. It also offers slip-resistant stability on both wet and dry trails. Angled lugs hook onto the terrain easily. There are also gripping lugs surrounding the edge of the outsole, providing durable traction for lateral motion. There are flex grooves to give the shoe adaptability and agility when running on uneven surfaces. The design of the grooves is a mix of horizontal and vertical lines that run across the outsole, therefore ensuring support for the entire foot. The Bare Access Flex features the FLEXconnect™ technology; it uses a material that is denser and more durable compared to the conventional foam of other running shoes, thus making it stiffer and more capable of handling lateral movement. There is an integrated EVA footbed that possesses anti-microbial properties to prevent bacteria from causing odor or infections. The mesh upper is breathable and has a moisture-wicking characteristic that keeps the foot dry and comfortable while lessening distractions during the running session. There are TPU overlays on strategic locations to hold the foot in place and to provide additional support while running. It also features an internal lining made from a combination of mesh and neoprene fabric, which is meant to control moisture and to combat odor-causing bacteria. The lacing system is a traditional lace-up closure with an additional eyehole to enable lace locking. Hyperlock™, a printed heel counter made from thin TPU material, promotes security during quick descents and sharp turns.